Stay connected by signing up to recieve this e-newsletter. You’ll receive Power Tips and information on upcoming events. Get Expert Consulting - This specialized leadership consulting is tailored to meet your needs and personally crafted by Roslyn. Master your development and take advantage of Roslyn’s POWER Leadership Consulting to help you become an effective leader in your personal and professional life. Path to Empowerment - People around the world are tapping into their POWER Factor! Learn how you can too! What People Are Saying - Find out what people are saying about Roslyn’s dynamic POWER Workshops. You can use their lessons in your own life.. Check out Roslyn's Blog - Keep up with what's going on with Roslyn by checking in on her Blog. Join Roslyn's Mailing List- Join Roslyn’s mailing list and you’ll receive tips and information on upcoming events. It’s another way to stay focused on your success. 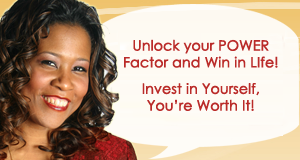 Find what you need to "Unlock Your Power Factor"
What do all successful people have in common? They have an understanding of the importance of having a direction in their life. Able to truly define their core purpose so that winning is absolute. Roslyn has created this audio cd and workbook to give you essential principles to finding and unlocking your POWER Factor. These products are designed especially for you so that you are Motivated, Mentored and Empowered to believe in yourself, your goals and your dreams. The 5 Proven Principles of Success are lessons learned that many of accomplished individuals know but seldom share. Based on her true life experiences, Roslyn Ridgeway gives you the 5 Proven Principles you need to reach your goals and be empowered. The 5 Proven Principles of Success: What it Takes to Design the Life You Want and Get It! Workbook will help you reach your goals in 5 easy steps! Order your copy NOW!